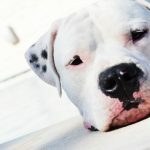 While many people will own a Dogo Argentino as a family pet equally so there are many people across the world that enjoy the thrill of dog shows and exhibiting their perfect Dogos. 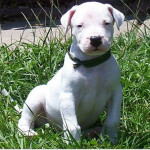 The Dogo Argentino breed standard is very important. 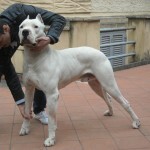 The Dogo Argentino is classed a Big-game hunting dog and under the FCI classification rules falls into Group 2. This includes other breeds such as Swiss Mountain and Cattle dogs, Pinschers, Schnauzers, and Molossoid breeds. It is important that the proportions of the dog are correct; the muzzle should be concave and the same length as the skull. The height when measured to the withers should only be slightly higher than the croup. The height as the withers is only allowed to be exceeded by the length of the body by a maximum of 10%. Chest depth in this muscular breed is important and this should be at least 50% of the height to the withers. The skull is convex when viewed in profile and the stop should be clear but not sharply angled or too deep. The nose must have black pigment with the nostrils well-opened and the lips should also be black. The teeth should be strong and well-developed with the correct bite. Over-shot or under-shot are not allowed in the Dogo Argentino Breed Standard. The eyes like the lips and nose should have black pigmentation and be almond shaped and of medium size. The ears are generally cropped and erect in a triangular shape. If they are left natural the ears are broad and flat with a rounded tip. The hair on the ears is slightly shorter than on the rest of the body and can have small spots of colour which are allowed. The body is rectangular in shape and the outline should be well-defined with a long tail that is quite thick. The tail hangs down naturally but when the Dogo is in action it will be curved over the back. The movement of the Dogo should be firm and purposeful always ready to be modified through quick reflexes when necessary. The Dogo when at full gallop is a splendid sight and this gait shows off the tremendous power and rear propulsion. Pacing in a Dogo is not accepted and is a serious fault against the Dogo Argentino Breed Standard. The skin is thick and covers the body without wrinkling except for on the throat. Despite the white coats Dogos can sometimes have black pigmented skin and this is acceptable. The hair is short and smooth and uniform in length. The thickness of the coat can vary according the climate the Dogo lives in. The only colour a Dogo comes in is white. A patch of black on one ear or eye is permissible. In the show ring the whiter dog would win if there were two specimens equal in all other ways. 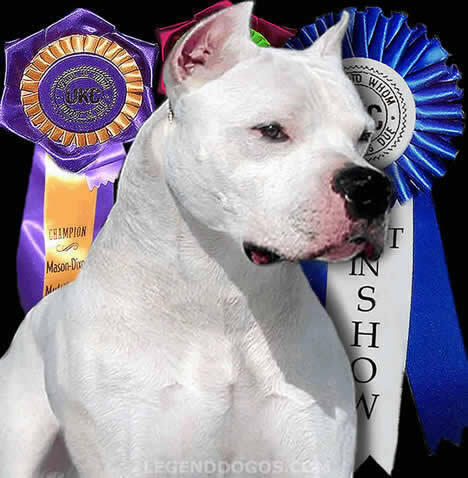 When in a show ring the judge will use his skill and knowledge of the breed to make sure the Dogo he is going over conforms to the standard as closely as possible. As the judge approaches the Dogo Argentino the first impression must be of strength and energy with unleashed power. The Dogo should be alert and aware of its surroundings but never give off a threatening aura.